Tenue du jour / Outfit of the day, with a new Renegade skin. 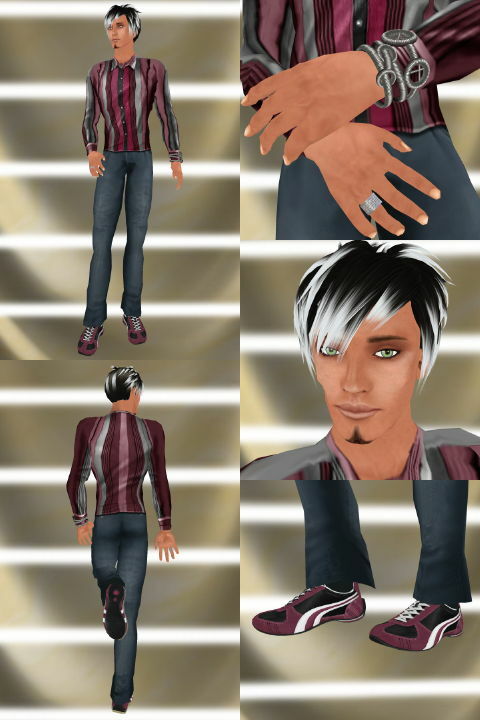 An outfit with a burgundy tone today, with nice striped shirt from “Style Starts Here,” coming in every possible layer and sold for 100 Lindens, following the more-than-fair pricing policy of the brand; a good pair of sneakers from FNKY! in the new range of “Racer” colors; and a nice hair from “Philotic Energy,” just updated with 96 new textures! New hair for men is always a good thing! These are from Shylah Honey (Dragonfly Design), come in twelve colors and two versions. I just discovered the work of Twob Larsen (Suite 17) who offers us a series of sunglasses in a “show off” style, meaning indispensable for hanging out on trendy beaches and places! A complete outfit, composed of 3 tops —a thermal (shown here), a tank-top and a v-neck T-shirt—, a pair of jeans and a pair of boots, for a low 349 Lindens.